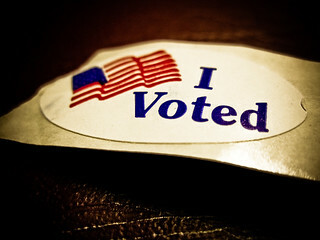 The Missouri Mom: Take your kids to Vote - it is the Cool thing to do! Take your kids to Vote - it is the Cool thing to do! As I mingled around town yesterday, reminding women that tomorrow is election day, I heard the excuse "oh I have kids" My thought is "and what is your point?" I just don't understand parents that do not vote, voting is preserving your children's future. From the time that Lesse was born she has been tagging along with me to the voting polls. Yes voting is a secret thing, but I am teaching her the IMPORTANCE of voting and teaching her to vote. Way back when (like when I was a child) my parents would get up at 5 am and swap turns going to vote, so that they would not have to me kids to the polls. When I turned 18 and it was my turn to go vote, I didn't even know where to go! What was worse, my mother handed me a sample ballot that had all the circles perfectly filled in and told me who to go vote for - sigh that is not the way to teach your kids to vote! Upon arriving at the poles I remember looking at the ballot and thinking, I really do not like how that man's name is spelled, I think I will vote for this woman instead." Long story short, I cancelled out my mothers vote, as I have many other years and will most likely in the future. When I became a parent, or shortly after I remember getting in a heated political debate with Lesse's grandpa and that was when I decided Lesse would know how to vote. In years past I have allowed her to be late for school, picked her up early, rearranged our day, done whatever it takes so that she has the opportunity to go to the voting polls with me. She stands quietly to the side, she sometimes knows who or what I am voting for, but she also looks forward to getting her "I Voted" sticker! Today I will proudly be voting with two maybe three kids in tow, we will be loud, no doubt the world will know who I voted for, but either way they will know where to go to vote, how to decide who to vote for, and the powerful feeling of filling in that little circle. So parents I beg of you to live a bit on the edge and GO VOTE!